This doesn't look like any vet's office I've been to before, Mom. I was hoping to have a follow-up to last week's Dognition post written today but I've come down with an awful bug that I just can't seem to shake. So, here's another picture of the pretty dog in the snow to hopefully win back your favor until I can get out of bed long enough to write a real blog post again. You don't mind if I just take a little nibble, do you? Oh no, go right ahead, invite your friends! But darn it, he's just too cute to kick out. Bella is a bright little bird. We have also always known that she is a champion at coercing people into giving her what she wants. This is probably a trait she used to her advantage on the streets of Puerto Rico where tourists and truckers alike will toss bits of scraps to scavenging pups. I don't know exactly how to qualify or quantify charm but whatever it is, Bella has it in abundance. No one can touch her and yet everyone falls in love with her. But the truth is, if Bella can't charm you into giving her what she wants, she'll figure out a way to get it herself. It is this combination of intelligence, personality and fear that has made our life with her a challenge and her psychology an adventure waiting to be discovered. Dr. Dodman explained to us when we first met with him that Bella is exactly the kind of dog that is most likely to have issues with aggression. Fearful, timid dogs shut down. Non-fearful, confident dogs don't react. Fearful dogs with big personalities and a bit of boldness tend to have the highest level of conflict going on inside of them which they don't know how to control or regulate. Gaining this little bit of insight into Bella's personality from Dr. D gave us a whole new perspective on her behavior and I would happily spend every waking moment talking to anyone who could give additional information about what is going on in our crazy dog's head. But Dr. Dodman is a busy man and our fortunes don't run quite high enough to pay for his private, 24/7 tutelage. So when I first heard about 'Dognition', a science-based "personality test" for your dog created by Duke University neuroscientist, Brian Hare, I jumped at the opportunity to sign up. Yes, there is a fee and I know some people balk at this. Since the fee for a year is substantially less than the fee for a single visit with a professional behaviorist, I didn't let that bit of information dissuade me. In for a penny, in for a pound as they say. Dognition is not an IQ test for your dog as some people and the media want to claim it is. I'd liken it more to the Myers-Briggs type indicator test. Dognition is a series of games or tests that you play with your dog and record the results. When all the games are complete, the computers at Dognition, take in your information and process it through their algorithms. The profile compiled and sent to you at the end of the tests gives insight into what the results of the specific tests mean about how your dog processes information to make decisions. Reasoning - impulsive vs. logical. The results of each test place your dog's responses on a spectrum. The answers aren't true or false, there are gradations like on a scale from 1 - 10. Then, combining the results from all these areas, Dognition has created a series of 9 'types' ranging from Socialite ("Friend to all") to Star-gazer ("Free spirit") and Maverick ("Lone wolf") to Einstein ("The thinker"). There were certainly aspects of the results that just confirmed what we already instinctively knew but I did learn some things about our little wonder dog that I didn't know before. 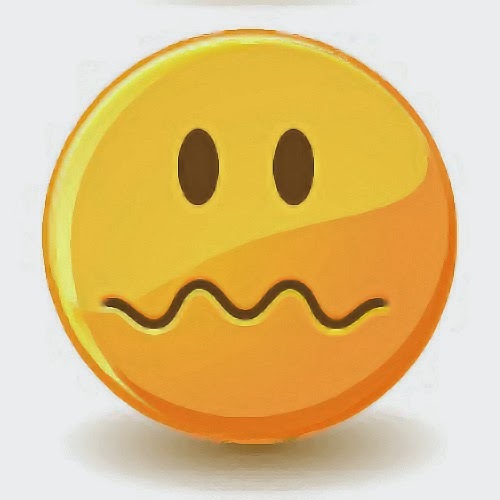 I read another review that suggested that the information gleaned from the games comes as little surprise. Of course, that review was written by Patricia McConnell, preeminent dog trainer and certified behaviorist so I'll suggest that most ordinary people playing the games won't know their dogs quite as well as she knows hers. Or dogs in general for that matter. It took us quite some time to finish the tests - this is not something you can or should try to complete in a day. Just like training, I found Bella most enthusiastic about playing the games when we kept the sessions short. I wasn't always sure of the point when doing the games but once we got through and her profile was assessed, certain aspects of what was being tested were made more clear. For instance, one of the games was about eye contact. You were to ask your dog to "Look" and time how long she would comply before looking away. We've worked with Bella on look extensively so I wasn't too surprised when she did this well and easily with me. This test was correlated to the "bonded/individual" dimension and even though Bella held my gaze for the longest possible time allotted by the game, she came in on the "Individualistic" side of the coin based on her responses in the other games for the "Empathy" dimension. Bella's responses and results, of course, left me wondering how much training impacts how well a dog complies. There was one test that had you tell your dog to 'Leave' a treat. Well, Bella of course left it because we have worked long and hard on teaching her that behavior. My boy Beau was never taught such a behavior because we never really needed it. He pretty much stayed out of stuff but if a treat fell on the floor, he was our living, breathing vacuum cleaner. I'm still not sure how the tests account for what is learned/trained behavior and what is indicative of how the dog thinks. As in the "Empathy" dimension, I suspect it is the results of the entire test that, taken together, create a picture of the thinking style of the individual dog. There are a few things I didn't like about the process that I would love to see added or changed. For one, you can only test your dog on the games once. I would have been very interested to see if Bella tested differently with me than she did with Jan. Well, let's be serious, of course she would have tested differently. My curiosity lies in how and where she would have tested differently and what it would mean in light of our different relationships. 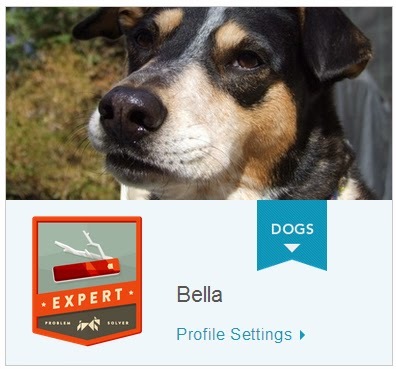 Another thing I would like to see done differently is the ability to change or at the very least, review the answers you give about your dog when setting up their initial profile. Some of the questions I remember being very black and white, not allowing for any nuance or shades between. For instance, one of the questions asks if your dog always or never gets along with other dogs. Does any dog ever get along with every dog all the time? I wasn't sure how to answer some of the questions in light of Bella's complexities. And finally, I wish the study had chosen to capture information about whether the dogs taking the test were strays, puppy mill rescues or forever pets. The group, via the Dognition application is collecting a great deal of information that can be analyzed by various segments: large dogs vs. small dogs, herding breeds vs. the toy group, even one breed vs. another. But there is no data point that captures where/how you got your dog so there is no way to analyze strays vs. pets, purchased vs. rescued. I just think this would be an interesting aspect to pursue. We chose to sign up for a year which gives us access to additional tests and some of the data collected by this adventure in citizen science. It has been fun and gives us something to do together as a family that keeps Bella's interest especially on these long, dark winter nights when we're all stuck inside. Disclosure: This is not a solicited review. We signed up and paid for Dognition. I am just sharing this information because I find it fascinating and hope some readers may be interested in hearing about our experience with it. I am so pleased to share a guest post with you today written by my new friend, Lorrie Browne. Lorrie will explain how we met but I wanted to just quickly give you an idea as to why I asked her to speak to you today. Back in October, Lorrie attended Best Friend’s Animal Society's 2013 No More Homeless Pets Conference and when she returned, she was so energized and enthusiastic about it, I asked if she would be interested in sharing her experience here on the blog. I am beyond thrilled that she agreed. Bella's mom and I became friends as a result of us both being moms of Scaredy Dogs - her Bella and my Brewster. Late one night after my rain & thunder phobic pup (Yes, I said rain! I live in the tropics and Brewster is afraid of rain!) had worn himself out, and my husband was asleep along with our 2 other dogs, there I sat, on the cold bathroom floor (his "safe" place), wide awake with my iPad, searching for kindred souls. 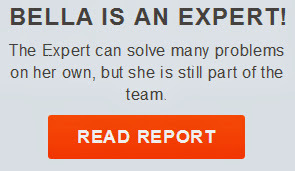 I stumbled on her awesome blog, "Bringing up Bella" and instantly felt less alone. Since then, we have enjoyed great conversations about our pups, training methods, pharmaceuticals, our patient families and the trials and tribulations of fearful dogs, animal rescue and advocacy. I got involved in rescue a few years ago. My dear Emma, a soulful and intuitive VizslaWeimer, had recently passed and our house was eerily quiet. While I knew I couldn't replace her, I ached for the daily routine of caring for a dog, so I took to the internet, in search of a dog in need of a good home. We adopted Roxie, a sweet but shy Weimaraner who'd spent the first 6 years of her life being bred in Kentucky. They were done with her and if a rescue didn't take her, they were going to kill her along with 5 other dogs. She needed a new home and our hearts needed healing. She has blossomed into a wonderful companion. This set me on a path I wouldn't trade it for the world. The plight of homeless dogs shocked me. I jumped in to help and this turned into a couple of years of being deeply entrenched in dog rescue. I saw the cycle from beginning to end and dedicated myself to observing, learning and trying to make things better. Dogs took over my life. I dreamt about them, talked about them constantly and was always trying to solve some problem. Reading, researching and taking classes on Maddie's Fund, the ASPCA and the Humane Society sites. I wanted to bring all these best practices to our rescue. While it was highly rewarding and filled a place deep in my soul, it soon became exhausting and I felt like I was on a treadmill, running at a pace that I couldn't keep up much longer. Recently, I've taken a step back to consider how I can best advocate on animals' behalf. While rescue is very necessary work - and I am grateful for every donor, vet, volunteer, board member, transporter, foster and employee who does it - it's basically cleaning up the mess that society creates. Instead, I wanted to search further up the chain and see what I could do to prevent these problems from happening in the first place. I wanted to gain more knowledge and hear the perspective of others who've been doing this work for years and have proven methods and data to share before moving forward. So, this past October I attended the Best Friend’s Animal Society 2013 Conference in Jacksonville Florida. I’d heard it was "THE" conference to attend but nothing prepared me for the information and inspiration I was about to receive. I signed up, got the last hotel room at the special rate (good omen :) but then the hard part began - figuring out what classes to attend! You can mix and match any combination of classes you like and there's no no commitment. You can choose up to the minute the class starts. I met shelter directors, volunteers, foster parents, shelter employees, transporters, vets, vendors, fundraisers, board members and advocates. 1500 people from around the world - the furthest participant from Australia. Since I've been working on an ordinance in my village to ban puppy stores and I'd like to help our county shelter improve, I focused on the "Animal Advocacy" and "Saving Them All" tracks and also took a course on Surrender Prevention. Each class offered a wealth of information and insight from the presenters as well as the attendees. Most sessions left time for Q&A which was informative as well as therapeutic. Anyone who's devoted time to animal rescue/sheltering knows it can be frustrating and overwhelming. We've all got a story... or 2... or 10. There were 1/2 hour breaks in between the sessions that flew by as I chatted with the most recent friend who I felt I could help or they me. I was surprised that the conference offered information for everyone from the person rescuing one dog at a time in their backyard to someone running a 200 animal facility. And everyone received equal respect and support. The focus was not only on the challenges we face; it was also a huge celebration of how far we've come in the world of animal advocacy. And that's something we rarely take the time to recognize. I left the conference feeling optimistic and empowered. Every rescue and shelter has different standards, fees and tests they’d like their adopters to pass. On the whole, public shelters have low fees and very few requirements. Some private rescues swing far in the opposite direction: home-visits, only allowing you to adopt if all your pets are neutered, not adopting to families with children or those that rent. "If 10 dogs are drowning and I am trying to save them all, I am not going to ask the people standing on the shore with open arms if they've had their home visit." We have to trust that people are going to do the right thing and most do given the chance. It's important that we address instances of animal cruelty but remember, those situations are the exception, not the rule. Most people love their pets and would do most anything to keep them happy and healthy. The rescue I was with did home visits for nearly 2,000 dogs per year and I was never convinced this was necessary. Some home visit volunteers were easily impressed by nice homes and neighborhoods and some adopters lost interest when the home visit took too long. Anyone can put on a show when they want something. I have a friend who is a huge rescuer/advocate tell me she gave her sister's address when she adopted her first dog. She was renting a place without a yard and feared she'd be turned down, yet her animals are treated like royalty. If you keep a dog in your rescue another week because the home visit has not occurred, that is a spot that could have been given to a dog in a kill shelter. Do the work on the front end. You can usually call their vet on the spot or verify they own their home. Ask about their lifestyle and match them with the best possible pet. Inform them of specific breed traits. Make it clear that you are there for support and if it doesn't work out, the animal is welcome to return and their adoption fee will be refunded. It really comes down this: Do you want to trust people or let animals die in kill shelters? I am aware the home-visit topic may spark a flurry of comments and I welcome the discussion. We all have a different approach to everything we do in life. Who says yours is the only way? I've heard harsh criticism about how this rescue/shelter or that one is being run. You can have an opinion but don’t harp on it and don’t use your energy to tear others down. Find an organization whose approach and values align with your own and jump in. If that changes over time, move onto another or start your own. Time and energy spent criticizing others is done at the expense of animals being killed. I took a great class called "Getting Along without Going Along" that addressed situations like this. But if you have a real concern for the welfare of the animals then help them improve or officially report it and follow up. That may be your contribution. The point is that you cannot effectively rescue animals and police other organizations at the same time. 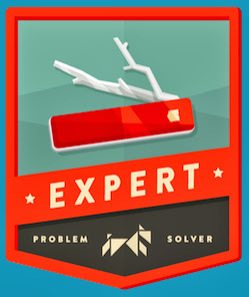 Choose your battles for maximum effectiveness and aim to be objective. The Call to Action at the conference was "Save Them All". Imagine that, when we've often been told by others that "we can't save them all!" I know I've had rough days when I used that phrase to convince myself I'd done everything I could - but deep down inside, I didn't buy it and neither does Best Friends Animal Society. Here are some statistics that may blow your mind - for better and for worse. Thirty years ago, in 1983, 11 million dogs and cats were being killed in shelters each year. It was a horrific situation. Sure, there were always people saving and adopting animals but they were in the minority and most people weren't even aware a problem existed. The founders of Best Friends Animal Society, decided it had to stop. They set out to unite people and create a more humane world and so far, they are doing an awesome job. Today, 4 million healthy, adoptable animals are dying in shelters each year. While this remains tragic, it's a nearly 75% decrease in animals killed in the past 30 years. With animal consciousness rising, social media and pets now treated as family, imagine what we could do in the next 10 years? The gap is closing and it's an exciting time to be an animal lover and advocate. It does require an investment to attend the conference. There's travel, hotel and the conference fee was $325. Breakfast and lunch were included. The conference fee itself is a great deal compared to conferences I've attended in other industries. I don't know that I will be attending every year but it's certainly worth a spot on your bucket list and if you can swing it, a trip every few years. They are an innovative group that not only runs an awesome rescue and sanctuary but they pay it forward. They know that exponential growth is powerful and that by teaching others, they expand their reach. To be surrounded by a group of like-minded people for such a wonderful cause created an energy I've rarely felt. So if you've been on the fence, it's time to make the trip! Attending this conference will empower you with knowledge, confidence and renewed dedication and you will help save more lives. Does it get any better than that? 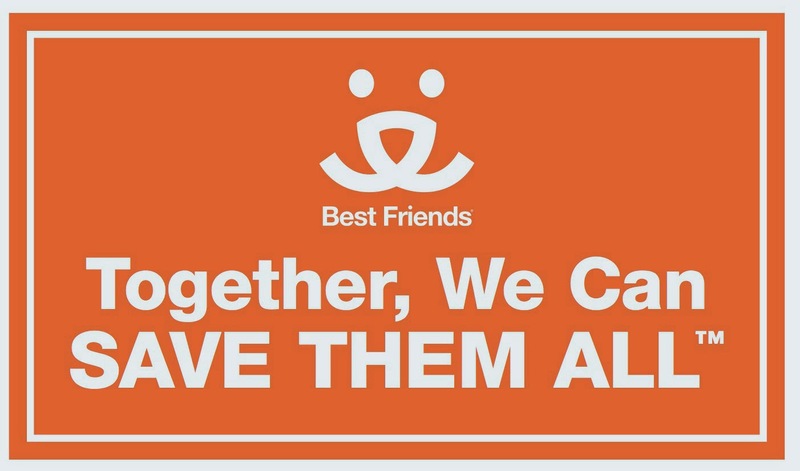 Here’s a FREE link to all the PowerPoint presentations from the 2012 and 2013 Best Friends' conferences. You can also order the full audio and PDFs for $89.95. Be sure to sign up for the newsletter and they will keep you informed about the 2014 conference in Las Vegas. Lorrie Browne is a dedicated animal advocate who became highly active in dog rescue shortly after adopting her Weimaraner, Roxie, who had spent the first 6 years of her life as a puppy mill mom. As a Board Member and volunteer, she has been highly involved in the areas of animal care, adoption, shelter systems, veteran adoption programs, website administration and fundraising. More recently, she is focusing on a local ordinance to prevent puppy stores in her town and the Best Friends Animal Society movement to "Save Them All." 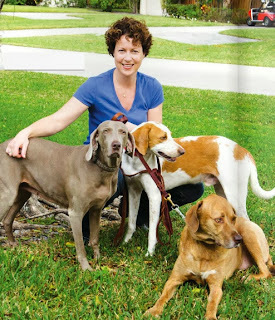 By day, Lorrie is an interior designer and lives in South Florida, with her very supportive husband Tim, Roxie the Weim and Gunther & Brewster - the 2 "foster" dogs who never left. We were paired with a young blog called Our Four Legged Family and right away set about getting to know them and their handsome dog, Diggs and lovely cat, Isis, both rescues. "Our floor is covered in pet toys, and our pockets smell like pet treats more often than not, but we love it, and wouldn't change a thing. Welcome to the fur zone!" I loved that and immediately thought, "these are my people." 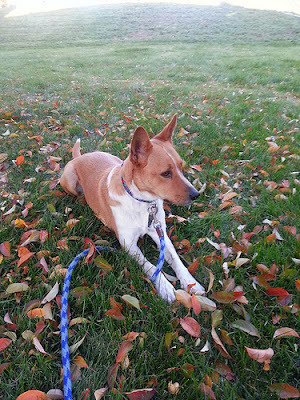 "We’re still not entirely sure what the other part of the “mix” is, but there have been strong suggestions for Basenji based on his coloring, talking, feline-esque habit of washing his face, and epic aversion of water." I don't know, you may have to be a Basenji-phile to get that but, since we believe Bella is also part Basenji, I was nodding both in agreement and commiseration. 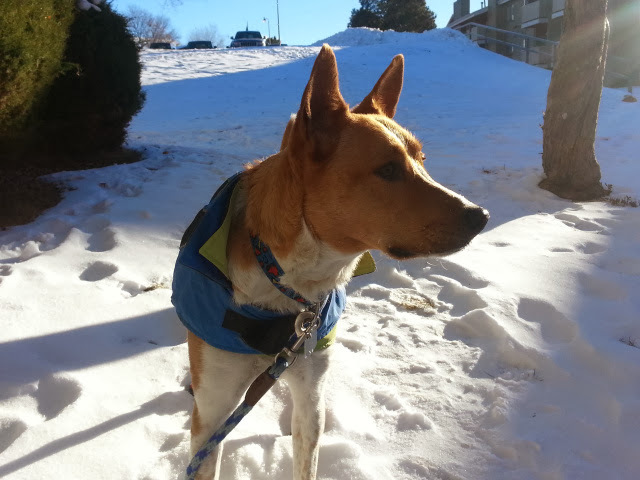 "Diggs has a super sensitive stomach, struggles with separation anxiety, is frantically protective of me, and has unwarranted fears about more things than we realize most of the time." What has impressed me most about Savannah and Diggs and their "Four Legged Family" is the dedication made to help Diggs become more comfortable in his own skin. We certainly know what a commitment that is to make to a fearful dog and welcome them to an ever-growing community of people trying to figure out and help their screwed up mutts. As a new blogger, it can be difficult to meet other bloggers and find your voice and your niche. Savannah is already doing a great job finding her voice. Her writing style is welcoming and funny. I feel like I'm reading the thoughts of a friend, not being lectured to even when she tackles more controversial subjects like Breed-Specific Legislation and the ever-contentious Dog Food discussion. I am so looking forward to watching Savannah continue to find her voice and speak up on issues that inspire her. And I can't wait to see what's in store for Diggs and Isis and the rest of their family in 2014. So please join me in welcoming Savannah and her crew to Blogville by hopping on over and leaving a comment to say hello. Images totally stolen with impunity from Our Four Legged Family. It was here just yesterday. Oh look, here's 2014 instead! Bella is hoping to dig up something interesting in 2014 and wishing you all the best!